New mythic fiction fantasy illustrated novel! Read or download a FREE excerpt or BUY on Amazon.com. My new novel of fantasy, fairy tales and mythic fiction. . . for all ages! It takes a motley assortment of characters to solve the case of the Curse of The Big Sleep. There’s trouble brewing when Snitch, the Tattle-Tale fairy, sets a crazy caper in motion. 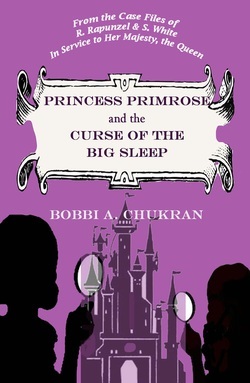 Who will save sleeping pretty Princess Primrose? R. Rapunzel and S. White, Inquiry Agents? Their seven helper elves---Nosy, Snoops, Sherlock, Stealthy, Creeper, Gumshoe or Marlowe? Or Weasel the Wizard, with his special potion? Filled with enchanted creatures, snappy dialogue (and a happy, yet twisted ending), anyone who believes in magic will love this fast-paced fairy tale caper. Illustrated with fourteen fun black and white drawings by the author. Available now in e-book and paperback.